In one of the largest campaign donation forfeitures in state history, 48 improper donations from the Pfizer Inc. political action committee will be forfeited by political campaigns and committees across the state. The contributions, totaling $53,500 to 36 different committees, were uncovered in a recent audit by the State Board of Elections and Ethics Enforcement. They came on June 21, 2016 and October 16 2017 — both days when the General Assembly was in session. Under state law, contributions are prohibited during legislative sessions. 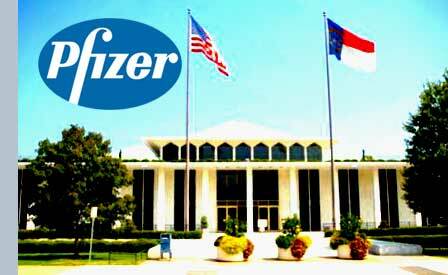 In an April letter from the board, Pfizer was made aware that the contributions must be turned over to the N.C. Civil Penalty and Forfeiture Fund. Auditors noticed improper donations to several candidate committees on the two dates, Gannon said, which led to a look at all Pfizer contributions. As it turned out, a majority of the donations from the pharmaceutical conglomerate’s PAC to North Carolina campaigns in both 2016 and 2017 were given on prohibited days. The prohibited donations totaled $20,000 in 2016 and $33,500 in 2017. The committees have until 30 days after they were notified to respond. Gannon said 24 of the contributions (see PDF) have already been forfeited, with more coming in nearly hourly. The money will go to the state’s Civil Penalty and Forfeiture Fund. Gannon said it will go toward public education. Sharon Castillo, Senior Director of Pfizer’s Media Relations, described the timing as an unfortunate clerical mistake by an outside vendor. “The checks were not sent out or received by the campaigns during the blackout period. Rather, they were dated during that time, something that is also precluded by the NC statute. We have never faced a similar situation. We take this matter very seriously, and are addressing the situation to ensure that it does not happen again,” said Castillo. Experts on political contributions called it a major and uncharacteristic error from such a large, well-established PAC. The contributions themselves were fairly standard — mostly in increments of $500 or $1,000 with some higher dollar contributions to high level Democratic and Republican leaders. The campaigns of Gov. Roy Cooper and Attorney General Josh Stein, both Democrats, each received $5,000 in 2017 — just shy of the $5,200 maximum contribution. Pfizer Inc. PAC records show a donation of $3,500 to Cooper’s Republican opponent, former Gov. Pat McCrory for the 2015-2016 period. The McCrory donation does not appear on the list of those that occurred on prohibited days. The campaigns of Senate President Pro Tem Phil Berger and House Speaker Tim Moore, both Republicans, each received $1,500 in 2016 and $2,000 in 2017. While some PACs give for ideological reasons, Barber said, PACs representing large conglomerates like Pfizer generally give with an eye toward access. Greg Flynn, an activist who has been carefully following campaign contributions in North Carolina for years, noticed and tweeted about the forfeiture letters earlier this month. He said he wasn’t necessarily surprised to see Pfizer giving so much money to state politicians all along the political spectrum, but also thinks most people might not realize how typical that is. Flynn, who recently became chair of the Wake County Board of Elections, says he has dialed back his interest in individual lawmakers’ campaign finance problems but maintains his interest in government transparency and campaign finance in general. The state board needs to be given the resources to check campaign contribution documentation thoroughly, Flynn said — and needs to maintain a commitment to it. Pfizer making an error that will force the forfeiture of tens of thousands of dollars in campaign contributions did come as a surprise, Flynn said.